Can you confirm these amateur observations of Phymaturus palluma? Type locality: Central Chile (higher Cordillera of Chile fide GRAVENHORST 1838). gynechlomus: Argentina (CW Mendoza); Type locality: in rocky slopes near Cruz de Piedra River, 2 km W of Alvarado Refuge of Laguna del Diamante Reserve, (2433 m elevation), San Carlos Department, Mendoza province, Argentina. Diagnosis Diagnosis (gynechlomus). Phymaturus gynechlomus is a member of the flagellifer (= palluma) species group because it exhibits juxtaposed superciliary scales, which are small with a quadrangular shape; fragmented subocular scales; well developed caudal spines and more than two rows of lorilabial scales between supralabial and subocular scales. The dorsal colour pattern of males of P. gynechlomus as well as the unique dorsal colour observed in females, which lacks dark spots, differentiate these species from the remaining members of the flagellifer group. P. gynechlomus belongs to the palluma group (fide LOBO et al. 2010). Comment Subspecies: The former subspecies P. p. patagonicus has been elevated to species status by CEI 1971. Phylogenetics: for recent comprehensive analyses see Reaney et al. 2018 and Lobo et al. 2018. Synonymy partly after PETERS & DONOSO-BARROS 1970: 227. Phymaturus gynechlomus CORBALÁN, SCOLARO & DEBANDI 2009 is a synonym of P. palluma fide Lobo et al. 2010, and TRONCOSO-PALACIOS & LOBO 2012. Distribution: Scolaro (2010) claimed that Sierra de Uspallata should be considered the type locality of Phymaturus palluma, and that probably Darwin collected the specimen (today neotype’s species) in this area. Distribution: not listed by Ruiz de Gamboa 2016 for Chile. Group: This species belongs to the palluma group (fide LOBO et al. 2010). 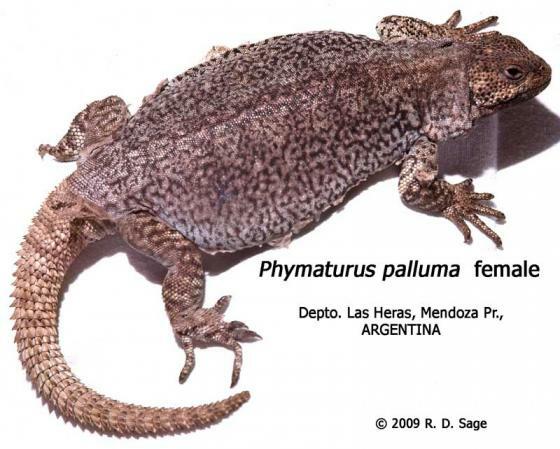 ETHERIDGE & SAVAGE (2003) suggested to conserve the widespread existing usage of the generic name Phymaturus Gravenhorst, 1837 and the specific name P. palluma (Molina, 1782) for a genus and a species of lizard (family LIOLAEMIDAE in their opinion) from South America by designating the holotype of Centrura flagellifer Bell, 1843 as the neotype of Lacerta palluma Molina, 1782. Phymaturus and P. palluma have been used in this sense since the name L. palluma was first misapplied by Gravenhorst in 1837. 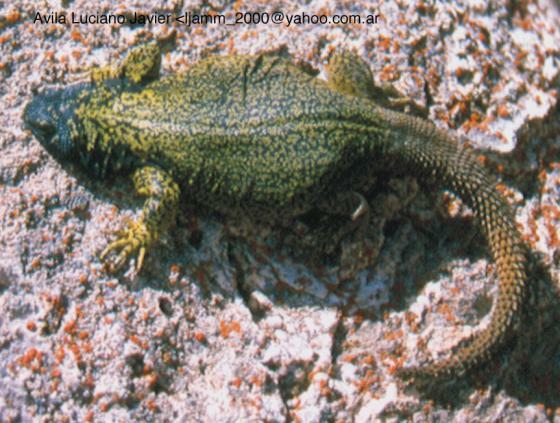 In their application it is accepted that Molina's lizard was actually Callopistes maculatus Gravenhorst, 1837. 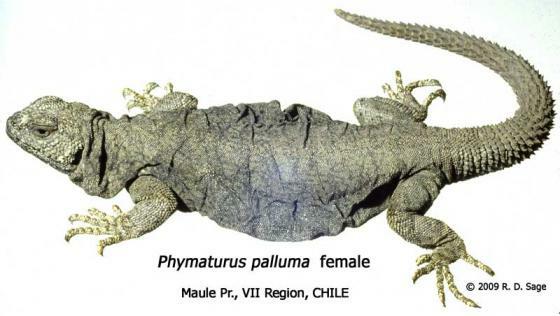 The ICZN has ruled (ICZN 2005) that the current usage of the generic name Phymaturus Gravenhorst, 1837 and the specific name P. palluma (Molina, 1782) for a genus and a species of lizard (family LIOLAEMIDAE) from South America is conserved by designation of the holotype of Centrura flagellifer Bell, 1843 as the neotype of Lacerta palluma Molina, 1782. Cei & Scolaro (2006) proposed the holotype of the iguanian synonym Centrura flagellifer (Bell, 1843) as neotype of Phymaturus palluma (Molina, 1782), the misidentified type species of Gravenhorst 1837. Such a neotype should be named Phymaturus flagellifer (Bell, 1843) in agreement to the real taxonomic position of the Molina’s species, a Teiid Callopistes, a lacertilian genus strikingly distant from the iguanid genus Phymaturus. Type species: Lacerta palluma MOLINA 1782 is the type species of the genus Phymaturus GRAVENHORST 1838. 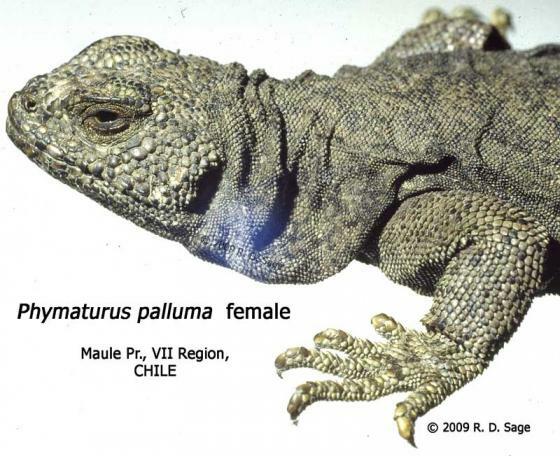 The genus is characterized by robust lizards of stout, wide and flattened bodies that can squeeze into small rock crevices, thick tail with mucronate and spinose scales, lateral nuchal skin folds with fat-filled pouches, among other exclusive characters (Cei 1986; Etheridge 1995). Etymology Etymology (gynechlomus): The species name derives from the peculiar dorsal coloration observed in females, in which the background is uniform and lacks any particular pattern of dark spots, as observed in other Phymaturus species. Cei, J.M. 1986. 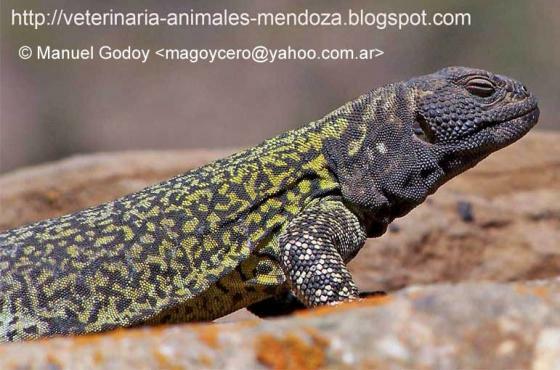 Reptiles del centro, centro-oeste y sur de la Argentina; herpetofauna de las zonas aridas y semiaridas. Mus. Regionale di Sci. Natur., Torino, Monogr. 4: 527 pp. Molina, Don Juan Ignacio 1788. COMPENDIO DE LA HISTORIA GEOGRAFICA NATURAL Y CIVIL DEL REYNO DE CHILE, Escrito en italiano. Traducida en español por Don Domingo Joseph de Arquellada Mendoza. Madrid, Don Antonio de Sancha, 437 pp. Scolaro, A. 2006. Reptiles Patagónicos Norte. Una guía de campo. Edic. Universidad Nacional de la Patagonia, Trelew, 112 pp.